This post is the sixth in a weekly series intended to briefly spotlight those things that you need to know about new features in BizTalk Server 2013. 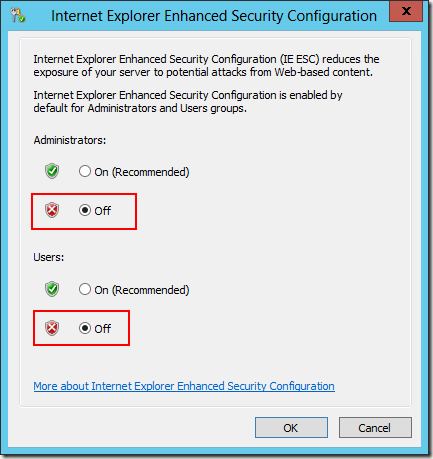 In this blog post, I’m going to take a little bit of a departure (for this week only) from the tone of my earlier posts – which focused on scenarios you will encounter after using the product – and look instead at things that would be of interest to people who are new to product, or are still evaluating BizTalk Server 2013 as an option for enterprise integration. By far the quickest way to get started with BizTalk Server 2013 is to be handed a machine that has it pre-installed. With the Infrastructure-as-a-Service offering in BizTalk Server 2013, we have just that. In fact, we have it both for production as well as evaluation use. While attending “//build/” this week (quick shout-out to those also here), I spent some time in the big room next to the Windows Azure booths. They had 3 challenges for attendees that involved completing certain tasks using the platform, and were offering a prize for each challenge completed. They were designed to sound somewhat difficult, yet prove to the participant just how easy life can be with Windows Azure. 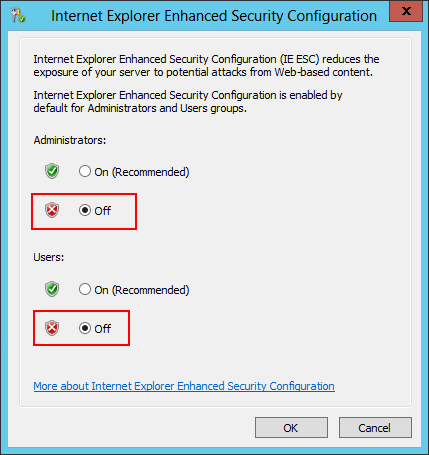 The first challenge was to provision a virtual machine running Windows Server 2012 — a trivial task (like it should be). That should kick-off the provisioning process for the Virtual Machine, and also starts off your first coffee break within this process. So you have a virtual machine running BizTalk Server in the cloud, now what? Well you probably want to get connected, and remote in so that you can make use of it. That can be done by clicking the Connect button in the toolbar while the virtual machine is highlighted in the list of Virtual Machines. This will cause a .rdp file to download with all of the settings (DNS name/port) required to make an Remote Desktop Protocol (RDP) connection, and fire up the Microsoft Terminal Services Client (still named mstsc.exe) to make it all happen. Make sure your internal firewall allows this, or you will not have much fun after this point. You will be connecting using the user name that you entered while creating the virtual machine (not your internal domain account). The virtual machine starts out in workgroup mode, and will not be joined to a domain. I think we all know that secure != usable, and sometimes there is an inverse relationship between the two. You will find this to be the case with the virtual machine that you have just provisioned. It is configured to be a headless server by default, and to have a really small attack surface. That’s fantastic, and I love security by default. However, for our purposes of evaluating the product, and doing some development within the Virtual Machine, it’s probably not our first choice. If you’re evaluating BizTalk Server 2013, it’s likely that you will want to have a development environment available to you – Visual Studio 2012 would be our environment of choice in this case. If we want to do anything interesting with BAM activities and views, we will also need Microsoft Office installed. At this point you will have quite a few tools installed, but a BizTalk Group hasn’t yet been setup. Luckily, since you’re using the Evaluation image, you already have SQL Server installed and ready to serve. At this point you could run through the configuration wizard, or you could go with some happy defaults and just get it done. So let’s go with the happy defaults. Go ahead and download this file. What About the Adapter Pack / ESB Toolkit? Now that you have a fully configured BizTalk environment. Kick the tires, play around, look through this blog for some of the capabilities you can experiment with. After that, get some training to find out what BizTalk Server is really capable of. I recommend you check out one of our upcoming BizTalk Server 2013 classes. We have classes for Administrators and classes for Developers now available on the QuickLearn Training calendar. That’s all from me at //build/, see you next week! This post is the fifth in a weekly series intended to briefly spotlight those things that you need to know about new features in BizTalk Server 2013. Each new version of BizTalk brings with it support for the latest Microsoft Operating System, Database Engine, and Integrated Development Environment. It is listed as a new feature each time, and many tend to skip over that feature on the new features list. However, this is actually very powerful – especially when considering the change over time in those underlying platforms. 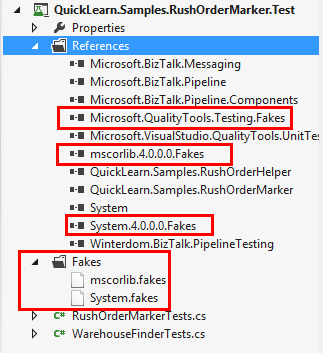 In this post, I’m going to examine how the Microsoft Fakes framework (found in Visual Studio 2012.2 Premium) can enable interesting testing scenarios for code that wasn’t built specifically for test. In the process, I’m also going to be using the Winterdom PipelineTesting library – which is easily upgraded to 2013 with some re-referencing of BizTalk assemblies. 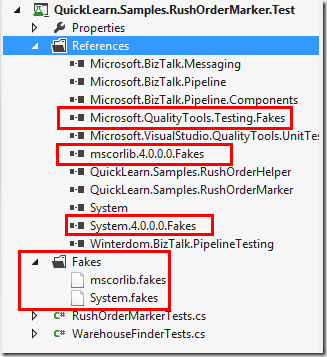 The Microsoft Fakes framework (available in Visual Studio 2012 Ultimate, or 2012.2 Premium edition and above) provides the ability to create both stubs and shims of any .NET interface or class respectively. While the stubs capability is pretty neat, they don’t feel nearly as magical as the shims. Consider that you have developed a pipeline component with a little bit of logic to inject a context property based on the current date/time. The scenario (although contrived) that I have come up with is that of an order processing system in which rush orders are all received through the same receive location. In that location is a custom pipeline that must promote a property to route to the warehouse that will be able to get the order picked and shipped the quickest (based on which warehouse is picking orders at the current hour, or will be doing so next). When testing the code, we will need to verify the behavior of the code at specific times. While we could write the code in such a way that the retrieval of the current date/time was done through a special date/time provider class (which implements some interface specialized to that purpose), the logic is being re-used from another location – one which will not be modified. BizTalk Server 2013 will rise to this occasion due to relying on Visual Studio 2012 as its development environment. We can use the included Microsoft Fakes framework to create a shim that will inject logic for all calls to DateTime.UtcNow to return a fixed DateTime object of our choosing. 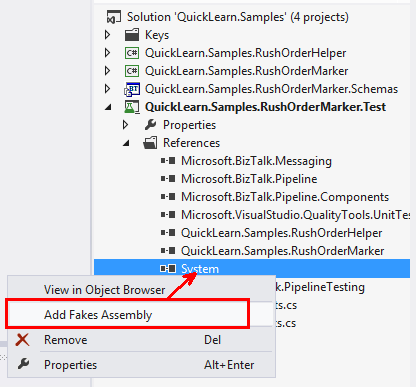 In order to get started, we need to instruct Visual Studio to generate some helper classes for the assembly or assemblies of our choosing. 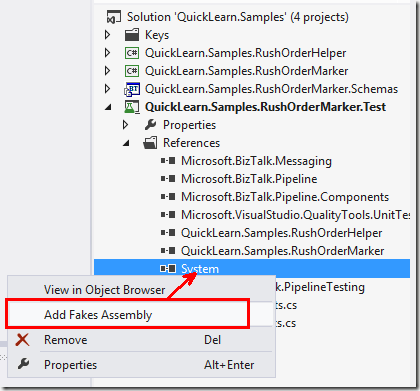 These classes will enable us to generate Stubs/Shims for classes within these assemblies. Now we will have to write the code in such a way that calls to DateTime.UtcNow will return the value of our choosing. In order to hook into those calls only within a specific portion of code, we will need to create a ShimsContext. Because the ShimsContext class implements IDisposable, we are able to wrap a using statement around it to provide better visibility of the scope it will control. Here we assign logic directly to System.Fakes.ShimDateTime.UtcNowGet that will execute when any code within the scope after ShimsContext.Create() was called attempts to call DateTime.UtcNow. We then submit a message through our pipeline and verify that the correct warehouse id was promoted into the context of the message (based on the current time). If you’ve just made the move up to BizTalk Server 2013, it really is important that you not only know what feature set you have in the platform, but also what is available to you in the underlying platform, and the tools you use to create your applications. If you want to learn BizTalk Server 2013 in the environment it was designed for, check out one of our upcoming BizTalk 2013 Developer Immersion, or BizTalk Server 2013 Deep Dive classes. The hands-on-lab environment is running the latest and greatest versions of Windows Server, SQL Server, and Visual Studio, so that you have the optimal BizTalk Server development experience.